Parametric modeling is a design method that deal with not the shape itself but the system. Metaphorically speaking, the target in parametric modeling is “function”. We do not design the result itself but its function. Functions produce a series of results but the results has certain tendencies in proportion to the function. 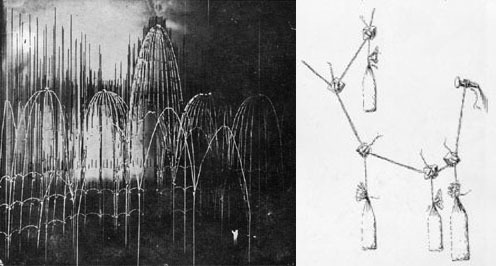 The figure on the right is a model for The Sagrada Familia by Antoni Gaudi, and is composed of wires and sandbags. In this model, we can see a basic philosophy of parametric modeling. 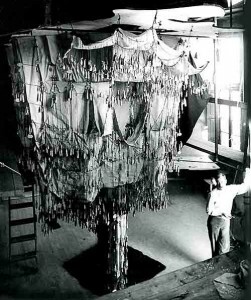 That is to say, the shape of the model is not determined by arbitariness of designers but is determined by the nature of gravity, and designer can only change the length of cables and adjust the positions of anchor points and sandbags. In this case, the nature of gravity is system, and the length of wires and positions of anchor points and sandbags are parameter. 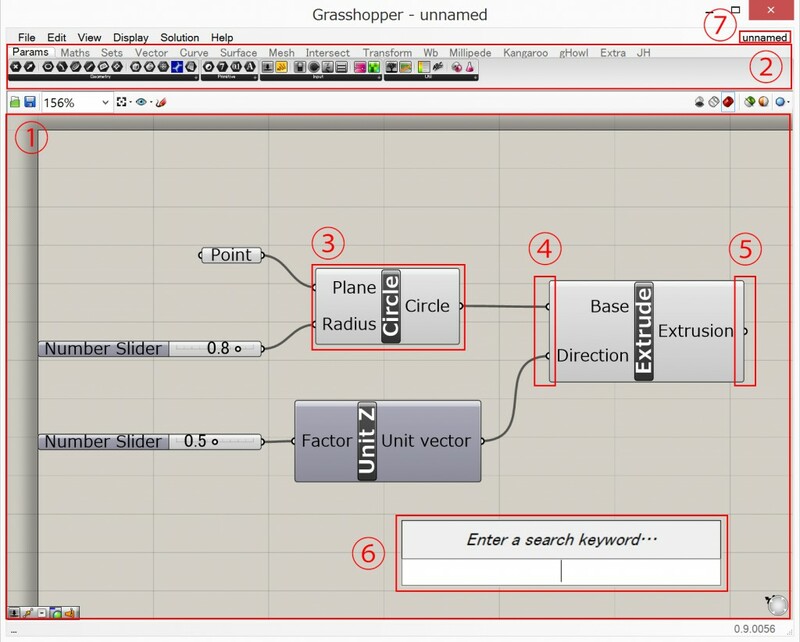 Grasshopper is a GAE (graphic algorithm editor) and is a plugin for Rhinoceros. We can make models by making its modeling workflow and putting certain input in it. The Grasshopper code, which is called definition in Grasshopper, is kind of function in mathematics. We can get certain geometry by putting some inputs in it. The main window in Grasshopper. We can put components on it. A series of tabs with list of components. Components are classified with type of manipulation. Component is a package that make a mathematic/geometric manipulation or analysis. Components have input ports on the left side of the box, and output ports on the right side. Basically the connection flows in one direction and cannot be loop, because Grasshopper components cannot make any recursive iterations. There are several data type in Grasshopper. You cannot input any data unless the type of input data accord with the expected data type by components. You can connect ports by clicking and dragging from output port to input ports. Disconnecting ports, click and drag ports with Control Key pressed. And for multiple connections, click and drag ports with Shift Key pressed. You can search components with keywords. It’s available by double clicking on canvas. Dealing with multiple files, click File Browser Control and select a file to edit. 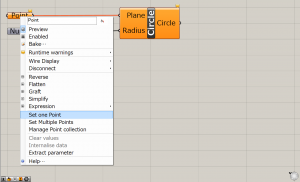 To input a object from Rhino to Grasshopper, put object container component on the canvas. Then right click the blank component and select “Set one …” or “Set multiple …” for multiple objects. 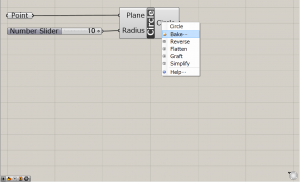 Objects in Rhino are just referenced and results in Grasshopper can be changed when the objects edited on Rhino. To fix the objects, right click object container and select “internalize”. 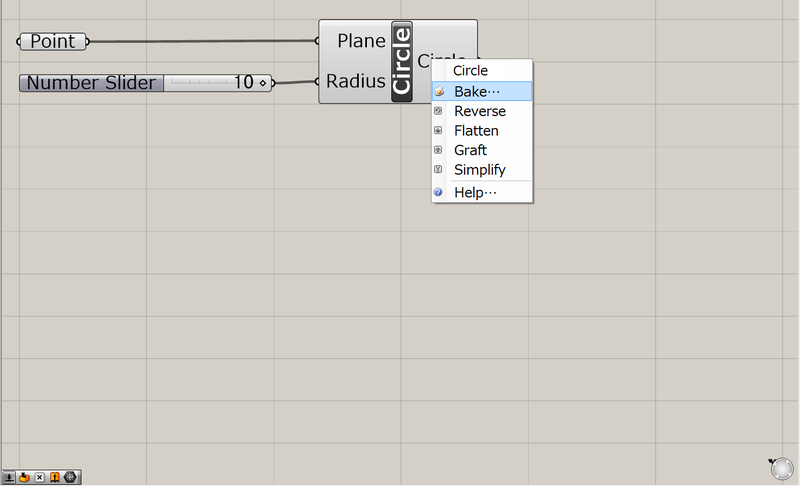 Objects in Grasshopper is visible in Rhino but not tangible. To edit a object in Rhino, right click the output port of the component and select Bake to export the object to Rhino. Baked objects cannot be edited and affected by any manipulation in Grasshopper. Grasshopper definitions sometimes go messy with bunch of wires connecting many components. We can organize these components by its function. 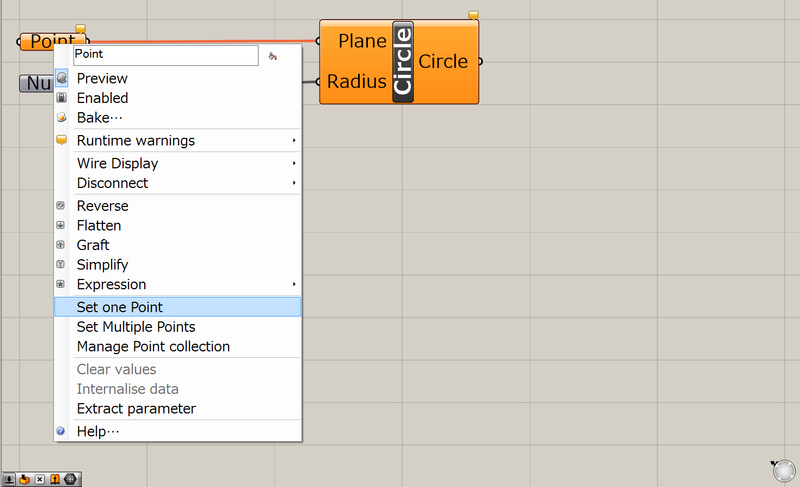 Cluster is a feature of Grasshopper to bundle a number of components into one component. To cluster components, select all the components and push space key and select cluster, which is displayed with cardboard box like icon.